One of the most exciting tournaments of the regular season has arrived! While weather has relocated the tournament to Stevinson, California, about two hours east of the Bay, expect all of these contenders to take their games seriously, playing for bids and bragging rights. It’s Stanford Invite time, baby! For all the community discussion about competition formats and sitting players for favorable matchups, Stanford Invite 2018 is getting it right. There is obvious incentive to decisively win your pool. Action in the 16-team format kicks off promptly at 9:00 AM Pacific Saturday morning1. If you’re an elite team, that means cleats on and running no later than 8:15. (Plus, most teams will have to make a two hour drive in the morning). All pools play three games. Win your group and the team is home by supper. Finish second or third? Prepare for a fourth game, at 4:20 PM on Saturday afternoon. Add it all up and teams playing prequarters in that final round will likely be at the fields from 8:00 AM to 6:00 PM, at least. Win that last game, and prep for quarterfinals at 8:00 AM Sunday morning. So even though teams will max out at four games on Saturday, the drawn out schedule will take its toll. Teams will be playing hard to assert dominance in the rankings and win bids. Emotions will run high. It will be exhausting. Leaving the fields at 6:15 in the evening and being back at seven sharp the next morning doesn’t leave a whole lot of room for recovery. There is a strong incentive to win your pool with this format. Don’t be surprised if there are couple of blowouts in that 8AM quarterfinal round, or if an otherwise talented team runs out of gas in semis. Who am I kidding, I don’t care about which round—just make this happen, ultimate gods. Presuming this game occurs on Sunday, the weather should be mostly sunny and in the high 50s with light wind; in other words, great conditions for watching maybe the division’s top offense (CUT) — led by Alex Olson, Henry Fisher, and Dillon Lanier — play maybe the division’s top defense (Darkside), led by Elijah Long and Nathan Kwon. Both teams are stuffed with talent and riding roster chemistry that’s been building among the top players for the last two or three seasons. North Carolina has the potential to play defense at a level that Carleton hasn’t seen yet this season. Minnesota stayed in vanilla matchup defense against CUT at Warm Up, and—all credit to to them—Brown doesn’t have the program playbook and pedigree that North Carolina does. Of course, Darkside has a history of saving their best defensive stuff for the postseason, so maybe don’t bank on innovative junk looks. Maybe do bank on top talents going toe-to-toe in matchup defense, especially if both teams have full roster health. The individual battles will happen all over the field. While the above matchup is still a hypothetical heading into the weekend, Pool D play will proceed on schedule. Each matchup promises to be interesting. Pool D one-seed Brown have a tall order to win all three games against Washington, Stanford, and Emory. Washington can match Derek Mourad against Brown’s Mac Hecht downfield if they like and rely on two full lines of defenders to get blocks. Stanford will be prepped to cover Hecht (maybe with Gabe Hernandez or Nick Hirning) and his top teammates and will likely do well against Brown’s zone look. Brown caused plenty of matchup problems at Warm Up when teams went matchup against them, so expect both the Sundodgers and Bloodthirsty to have at least a couple of other looks to keep BMo on their toes. And of course, all three teams above need to move past Emory to stay in contention for the bracket—no easy task if the visitors from the Southeast are getting good contributions from their top players. It feels like all of these teams are good enough to make quarters, but it’s likely only two will. Part of what makes CUT outstanding is how well-rounded their top players are. Oregon Ego, unbeaten coming into the weekend, feel similar. At their best over Presidents’ Day weekend, Ego straight up outplayed their opponents, regardless of set or condition. Ego has two stiff games on the schedule for Saturday: Colorado and Wisconsin. Both contenders have a strong history of smart, athletic defense. Both like to play in the air and generate lots of pressure. And both will come into their game with Oregon expecting to win it. This could force Oregon to tighten their lines earlier than they did in their first tournament, a decision they didn’t have to make in San Diego a couple of weeks ago. Fortunately, neither Colorado nor Wisconsin looks like they’re playing one-possession offense, so the Oregon D-line may get their chances to convert breaks early in both matchups. The pressure will be on the O-line to play smoothly and within themselves (a tall order at times for this group in 2017). 2018 Ego is feeding off of energy from the defense, though. Give Leandro Marx and co. a inch, and they’ll barge onto the track and run a five-minute mile. The breakneck pace at which the Washington Sundodgers won the Santa Barbara Invite lingers as what the team is capable of, playing in a good mindset in a two-day format. 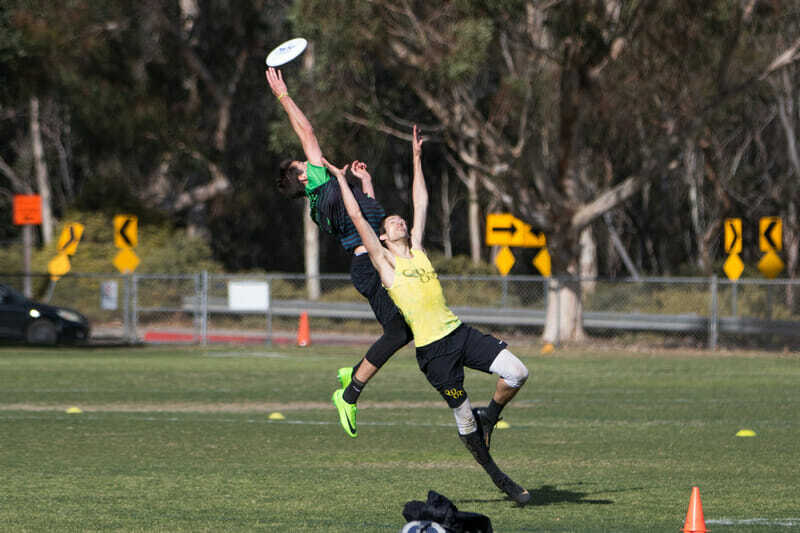 The sluggishness the team showed in quarterfinals at the Presidents’ Day Invitational as they were overtaken by a hot Cal Poly-SLO (and showed again the next morning in the wind during a loss to USC) is fresher on the mind, reminding the team that they need variety and positivity to play their best ultimate. Washington’s defense will have to contend with tough assignments when they play Brown on Saturday. Luckily, that happens first thing. Defensive coach DY Chen will have a fresh roster to look to when trying to contain the dynamic offense that powered Brown to the final at Warm Up. Head coach Mark Burton gets to throw as much of his playbook as he can at Brownian Motion to keep the defense on their toes defending pull plays, spread, and vertical offense. 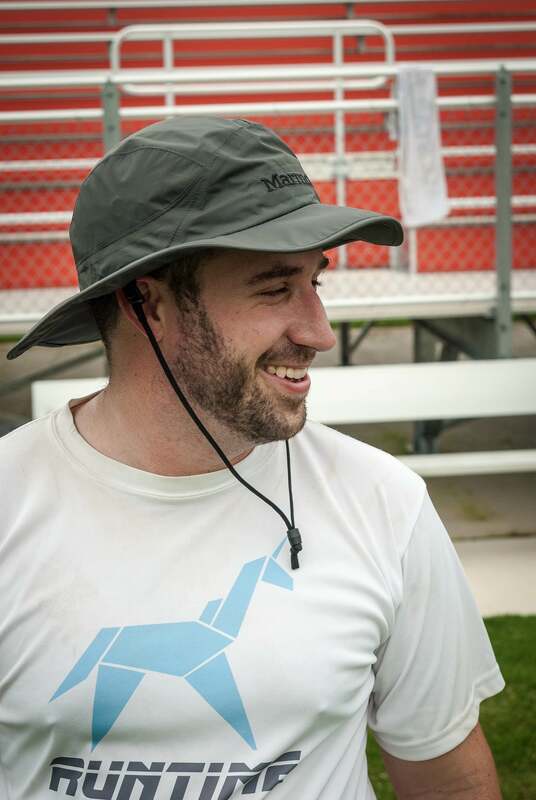 The Sundodgers have had stellar Saturdays so far this year—expect them to throw the kitchen sink at Brown to get a statement win and start the weekend off strong. It’s not out of the question for Washington to take Pool D, and the extra rest would set them up nicely for a quarterfinal against a lower seed Sunday morning. Making semis via prequarters isn’t out of the question for Washington, but it’ll be harder. Cal Poly-SLO won’t square off against Carleton until 12 PM on Saturday. They start their day playing a vert-heavy Oregon State that relies a lot on their top players. Next up, SLOCORE takes a bye in the 10AM round, resting legs before the marquee Pool A matchup. CUT did struggle at Stanford last year in the rain, and they had some issues against Brown in the wind two weekends ago at Warm Up. With weather a little iffier on Saturday afternoon, the conditions could be a boon for a SLO team that has some smart defensive looks that they can throw at CUT. Endurance may also be a question for SLO—some of their top players have nagging overuse injuries that could keep them limited throughout the weekend. Making semis will be a test of depth for the defense and a test of efficiency for the offense. The latter line found their stride late at Presidents’ Day. Caleb Meriam and Jeremy Dolezal-Ng have paired playing keep away and moving the disc into space, while Nate Pettyjohn and Conor Schofield have each found success in different cutting areas. Turnovers will cost them more against the higher competition. With another tough pool play game in store against UBC, SLO’s best results will come if they’re playing smart. If they get stuck in a late crossover round, it may take more than a little sip of cough medicine to recover Sunday morning and fight into semis. There is depth, talent, and consistency on the Thunderbird roster in 2018. Is that enough to survive the first game of the season against the favorite to win the National title? What a way to kick off the 2018 campaign. While all other contenders on this list arrive with tournament experience, UBC has yet to step on the competitive field. The Thunderbird defense will have their hands full trying to contain CUT and SLO. Their path to semis seems likely to go through prequarters. After a rough finish at Presidents’ Day, Mamabird has their work cut out for them this weekend. The competition will be a lot stiffer, and they’ve had little more than two weeks of practice to improve on their completion rates. They may need to rely on brute strength to power through the later rounds of Saturday to earn quarters, and then play a clean morning round to make semis. The hosts haven’t seen action for a month, and they spent almost all of Santa Barbara Invite playing three distinct, balanced lines. They’ll have had all of February to tinker with lineups and sort out the playbook. Patience defined Stanford’s first tournament appearance. They had the mental toughness to play dink and dunk offense against tough zones a month ago, and here on their (sort of) home turf, they’re going to present the kind of likely prequarters matchup that no rival will be happy in taking. When the team just wants to go home, but as the points start to drag, Stanford will win the mini games of wits. With no lack of smart game plans, the advantage of sleeping at home, and some true star talent in Gabe Hernandez, what the home team needs most is talent depth. Can they handle a Nationals-quality team in quarterfinals, if they make it that far? With CUT and Minnesota off to a hot start for the North Central, it feels like Wisconsin should be playing for a bid this weekend, not just a return to the semis and final of this tournament (which they won in 2016). Health is the big question mark here. Minimal injuries for the Hodags means maximum effort on both lines, making them as unsavory a three-seed in their pool as Stanford is in Pool D. But team health wasn’t in order two weekends ago. The team struggled to put quality performances together at Warm Up with key players like Tommy Gallagher and David Yu stuck on the sidelines. Of course, count on Wisco for defying the odds and making the semis anyways. I’m sure that I’ve jinxed myself by doubting them. Pittsburgh En Sabah Nur and California UGMO are getting a tournament spec bump, thanks to their talented poolmates from Provo, BYU CHI. Though CHI is talented enough to be seeded and finish second, they’ll head home on Saturday night no matter what. That means all three other teams from this pool are, at the very least, playing in prequarters. I’m not Cody Mills, so I don’t have the ranking algorithm fluency to tell you the math reasons for this last item, but this tournament is so stacked, is it possible that bids will be won and lost in consolation play? We’ll do our best to keep our eyes on the fifth and seventh place brackets for you. Comments on "Stanford Invite 2018: Tournament Preview (Men’s)"